White Haven, PA – There is still time to get some slope time in this season. 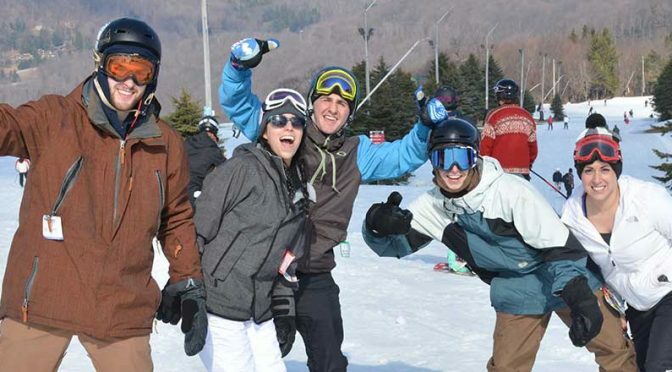 In fact, spring is a perfect time to gather up the troops and head to your favorite Pennsylvania area ski resort to take advantage of special appreciation days, celebrations and more. The Matt Pletcher Trio will be playing at the Clubhouse for a St. Patrick’s Day celebration to remember. So put your best green on and join in the fun. For more information, call (814) 239-1024. Saturday, March 18, 10 p.m.
Head over to the Clubhouse and rock the night away with a performance by “1 Over 8” starting at 10 p.m. For more information, call (814) 239-1024. Join Jack Frost Mountain for this year’s Spring Fling. Hang at the tailgate party, watch or join in the pond skimming fun and more. For more information, visit www.jfbb.com. April 16, 2017, 10:30 a.m. – 3 p.m.
Partake in an Easter Brunch Buffet in the beautiful Overlook Room in Liberty’s new Highland Lodge. The buffet features carved leg of lamb, sliced ham with pineapple glaze, Frosted Flakes crusted French toast and much more. Adults: $29.95, Children: 5-12 $15.95 and Children four and under free. Reservations are recommended. Call (717) 642-8282. Saturday, March 18, 12 p.m. – 6 p.m.
Head to Montage Mountain for a fun filled day of entertainment. Enjoy $20 all day lift tickets and $20 rentals or wear a costume and ski free. Pond skimming begins at 1 p.m. Round up your friends and stay for awhile, there will be an outdoor bar & grill, tailgate games and live entertainment, too. For more information, visit www.montagemountainresorts.com. In an effort to honor the brave men and women defending our freedom and our great Nation, Shawnee Mountain is hosting Military Appreciation Weekend Friday, Saturday & Sunday, March 17, 18 & 19, 2017. As a special “Thank You” all active Military and their immediate family (spouse & children 18 years and under) will receive free lift tickets and ski or snowboard rentals for any or all of the three days. Also, group lessons and SKIwee children’s lesson programs will be made available at a 50% discount. All branches of our Armed Forces are eligible, including Army, Navy, Air Force, Marines, Coast Guard & National Guard active duty members. For all retired military and reservists and their immediate family a discount of 50% off lift tickets will be offered during the Military Appreciation Weekend. Valid active military picture ID is required and valid dependent cards are required. All Military and their immediate family are welcome to enjoy any 2-hour snow tubing session for only $17 per session all weekend (with ID). And as a special bonus, those attending Military Appreciation Weekend are welcome to enjoy the Costume Carnival Day and Parade taking place at Shawnee Mountain on Sunday, March 19 at 1:00 pm. Call (570) 421- 7231 ext. 229 for more info. The 33rd Annual Costume Carnival Day is open to all. Those in full costume will receive a free same day lift ticket. A costume parade and judging will be held at 1 p.m. with prizes in several categories. For more information, visit www.shawneemt.com. Follow the rainbow to the pot of gold at Seven Springs for a fun day out on the slopes and celebration at the Foggy Goggle with Irish theme specials. 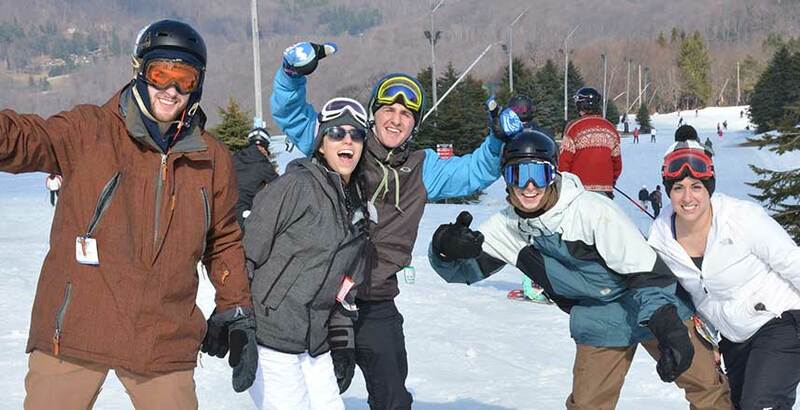 For more information, visit www.7springs.com. The Burton Qualifier Finals will be held at the top rated parks at Seven Springs on Saturday, March 18, 2017. The parks at Seven Springs have been the site of many a historic battle—and the Burton Qualifiers will make that one more. The park at Seven Springs will be a snowy battlefield as qualified riders from the semi-finals compete for the $10k cash purse. Expect a pro quality park riddled with flowing lines of jibs and jumps inspired by both urban and backcountry riding. The park is sculpted by the award-winning terrain park crew to bring out the best in competitors, so come ready to give it your all, soldiers! For more information, visit www.7springs.com. Join in on Saturday, March 18, at The Grille at Sporting Clays for the Jameson Irish Whiskey Dinner. Cocktail hour begins at 6 p.m. and dinner is at 7 p.m. For more information, call (800) 452-2223, ext. 7110. Pond Skim 2017, presented by New Belgium Brewing, at Seven Springs is sure to go down with a splash at 11 a.m. on Saturday, March 25, 2017! Whether you get wet attempting to cross the ponds or get splashed while watching from the Foggy Goggle, you’ll want to participate in the most fun event of the year. If you are up for the challenge, grab your skis or snowboard and see if you can be the one to conquer the double dip pond in your craziest costume. Win in one of the judging categories, and you could go home with a shiny new 2017-2018 Season Pass! Emcee’s Mikey and Big Bob for the KISS Morning Freak Show and DJ Mike Ley will keep the Pond Skim Party going at the Goggle all day while celebrity judges score for Best Skim, Best Costume and Best Splash. For more information, visit www.7springs.com. Sunday, March 26, 2 p.m. – 6 p.m.
Join Seven Springs on Sunday, March 26, 2017 from 2-6 p.m. for the annual Season Pass holder party in the Grand Ballroom. There will be hors d’oeuvres, games, giveaways and more. Make sure to bring your 16-17 season pass to gain entry into the party. For more information, visit www.7springs.com. Saturday, March 18, 11 a.m. The 9th Annual “King of the Mountain” Snowmobile Hill Climb hosted by Highland Lake Snowmobile and Outdoor Recreation Club will take place at Ski Sawmill. Registration is from 8 a.m. – 10 a.m. and the race starts at 11 a.m. Spectators 12 and under are free and everyone 13 and up is $5 per person. For more information, visit www.skisawmill.com.